Two CT Travel Group leisure brands, Medway Leisure Travel and Pettitts Travel have come together as one brand, giving clients greater choice on their authentic, tailor-made holidays. Medway Leisure Travel was acquired by CT Travel Group in 2012 followed by Pettitts Travel in 2015. After operating the businesses side by side for 3 years, and with CT Travel Group celebrating its 30th anniversary this year, it seemed like the perfect time to bring the two brands together, giving clients access to a larger team of Travel Consultants with specialist knowledge and with an expanded programme of holiday collections and travel experiences. It has been agreed that the brand name to take forward will be Pettitts Travel. Both the Maidstone and the Tunbridge Wells offices will remain open and clients are more than welcome to visit the team in either location. 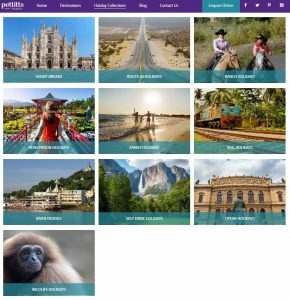 To coincide with the merger, a new Pettitts Travel website is now live with the addition of exciting destinations such as the USA, Canada and South Africa as well as tailor-made holiday collections including Route 66 holidays and Opera breaks. To view the new destinations and holiday collections please visit www.pettitts.co.uk. CT Travel Group Ltd was established in 1988 by CEO, Mark Kempster. This independently owned group is now well-established and has been turned into a multimillion pound leisure and business travel company with an enviable reputation within the areas that it operates.